“I still have to go 2 years before I am hundred”, says Elisabeth. Congo! joked the migrants, when they settled in Aboa-Basso to become labourers on the state oil palm plantation. Elisabeth came from Cape Coast with her children and is today living in her 1-room house, where she can move freely knowing all the walls by heart. Now the Congo community has received the eviction order. The land belongs to a Belgian investor who bought the land from the state-owned GOPDC (Ghana Oil Palm Development Company). The land of Kwae near Kade in Eastern Region was nationalized in 1975 under the ‚Operation feed yourself’ when Acheampong was ruling the country. The state ordered compulsary acquistion of 12,050 hectar of land but only inhabitants of 3000 hectar got compensation. Under democracy, with JJ Rawlings, this plantation decayed, the former employees harvested the fruits, and the trees also were cut down. People started to replant, farmers took the land to earn a living. With president Kufuor privatization became the order of the day. In 2002 the farm was turned into a company with limited liability, a Belgium investor was found and the government maintained a 40% interest in the enterprise. „Ex-Minister of Finance Dr. Anthony Akoto Osei, might currently be having sleepless nights for being careless with state asset, resulting in the loss of some Gh¢51 million, approximately US$31 million, to the state, according to Police investigators. The three Osei brothers -Dr. Akoto Osei, D.K. Osei, Secretary to former President John Agyekum Kufuor, and Albert Osei, the senior of the Osei’s and a former director of SIAT Ghana Ltd and GOPDC- a police investigative report suggest, hijacked the powers of the Divestiture Implementation Committee (DIC) to plot and succeeded in selling Ghana’s Oil Palm Plantation to a Belgian Company at a very ridiculous price, from US$18 million to US$3.6 million“. The police investigation showed, that the 40% shares sold to SIAT where 20% owned by the government of Ghana plus 20% shares reserved for employees, out-growers and small-holders of Kwae. http://iamaghanaian.net/index.php?do=/news/ghana-oil-palm-farmers-defrauded/ (25/6/2011) Government of Ghana had agreed in 1995 to off-load 20% of its shares to small-holders, out-growers (15%) and employees of GOPDC (5%). This means that the second 20% were acquired by SIAT from the state of Ghana, though they belonged to the people of Kwae, i.e. they were stolen! The value of these shares were estimated in 1996 to be 1.2 million US$. „I had to appologize, give 12 sheeps and 2 boxes of shnapps“ for asking who took the money for the land deal. The grabbing of the land started, when I was a young man and just installed as chief, says Chief Osabarima Adu Gyamfi III. The government confiscated the land and started oil palm tree farming. Under military rule nobody could complain. And this did not change with democracy: „I had to appologize, give 12 sheeps and 2 boxes of shnapps“, he remembers bitterly. Not 2 bottles, but 2 boxes. 24 bottles. His offense: he was asking the Ochehene why he agreed to sell the land of Kade to a Belgium Investor; and also how much money he got for the deal. Questions are not welcome in rural Ghana. Threatened with de-stoolment he had to apologize for asking. Now there is silence and the company takes one village after the other. Chief Osabarima Adu Gyamfi III is currently celebrating his 30th anniversary of enstoolment. All these years he had to witness that year after year village after village has disappeared. The development of the plantation was carried out in different stages: Compensation, clearance of village, and clearance of land. Today 8000 ha are used for the oil palm plantation – farmer’s work as seasonal workers, without permanent contract, with a salary under the minimum wage of Ghana, says the chief. Kwae community remains in poverty – there is not much development despite of the promises of the owners of the plantation. Nana, as the chiefs are called here, tried to negotiate with the company to get some improvements for the community: but 30 years later there is still no electricity, no running water, no school. GOPDC has founded a Junior High School in Kade – schooling in Kwae ends with JSS3. A small health center has nurses, but not doctor. SIAT, the company owning GOPDC, is claiming on thier website that they use 0.5% of their revenues for social responsibility projects, another 0.5% for environment responsibility. http://www.siat-group.com/corporate-responsability/ A big billboard talks about biodiversity, another signboard tells us that hunting is forbidden. But who dares to talk about biodiversity when 12,050 hectares of forest and smallholder farms have vanished in favour of a single species: the oil palm tree? SIAT is claiming to do sustainable oil palm farming. In March 2015 GOPDC has received their RSPO Certificate for Sustainable Palm Oil production. Obviously human beings do not form part of this concept of sustainability and biodiversity. The latest stage of development includes the village Congo. And this is where old and blind Elisabeth lives in her traditional clay house. Her children are dead, so the community takes care of her. But they all have to go. The company has paid compensation: between 250 and 2000 Ghana Cedis (80 to 500 €) per house. Dankwah Noah became speaker of the community and four other villages – today he is on the run, tells us the community. He found a lawyer in Koforidua, Hon. Asante-Ansong, who challenged the compensation plan of GOPDC. The court decided that the property has to be re-evaluated and that all the members of the communities should be included in the compensation plan. The evaluation board came and re-evaluated. Some people have received compensation and were shocked: Mary Donkor got 680 GHC for a 3-room house, Dora Asantewaa 1875 GHC, the blind and 98-year old Elisabeth 250 GHC. Members of the Congo Community went to court – and the judge approved compensation. But the amount is ridiculous. Even in Kade you can’t hire a room for this amount. GOPDC, environmental and social responsible as they claim on their website, was charged to pay 804,571 GHC compensation for 5 villages with 1100 households. This makes an average of 800 GHC per head. But they have received even less: the lawyer has taken 45% of the total amount of the compensation to cover his bill. A bus ticket to the court in Koforidua costs 18 GHC. With no relocation plan agreed upon, land to build a traditional house with clay and wood is not available. This year, the villagers have received an eviction order. But where should they go? Elisabeth hardly can walk with her 98 year old legs – the house and the support of the community is her only means to survive. SIAT has a share capital of 31,000,000 Euro – about 120 million GHC according to its own website. Ghana government is receiving rent from the land lease contract. The 20% shares of GOPDC that were fraudulently acquired by SIAT Belgium will have produced in the meanwhile millions of Euros of dividends. This money could easily build a town with electricity, schools and running water for the people of Kwae – including a house for blind and 98 year old Elisabeth. 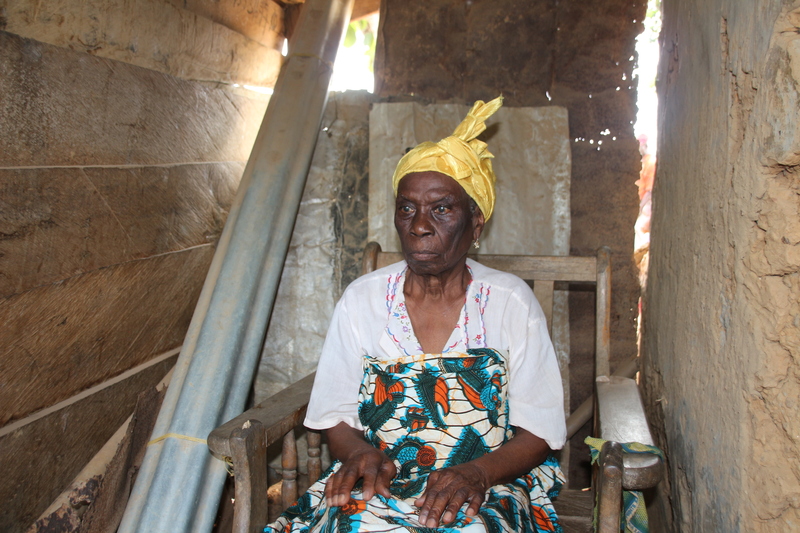 Congo does not exist anymore – Elisabeth had to leave her village last week when the community received their last notice to leave before the village is going to be demolished tomorrow. The families who settled here as labourers in the 70ies, when the plantation was set up, are still fighting for compensation. GII, the Ghanian branch of Transparency International is supporting their claim. This entry was posted in Case Studies and tagged agriculture, biofuel, FPIC, l'accaparement de terres, land corruption, land rights, landgrabbing, landjustice, LSLBI, westafrica. Bookmark the permalink.